BMW followed up yesterday’s leak of the all new G50 5 Series with the full release today, revealing the all-new platform, engines and specs, including the revelation that the new M550i currently beats the outgoing M5 from zero to 60 miles per hour. As far as look are concerned, the new 5-Series is pretty underwhelming. But underneath, everything is all new resting on BMW’s Cluster Architecture (CLAR) platform, so perhaps that’s something to look forward to. 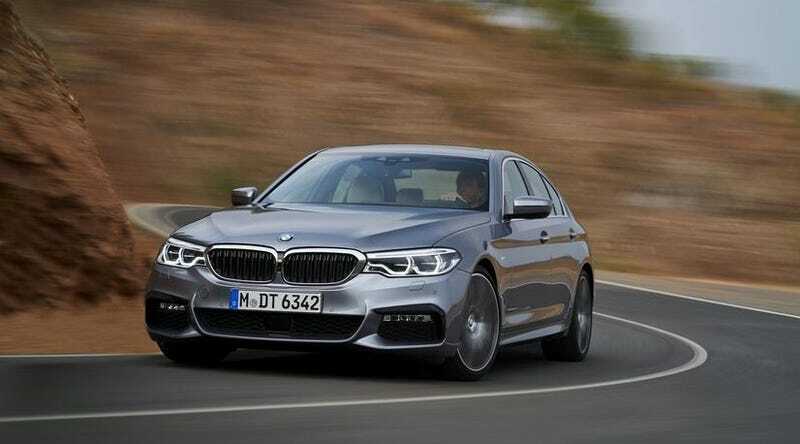 The 530i will come with a 2.0 liter four-cylinder good for 248 horsepower, the 540i with a 3.0 liter inline-six cylinder with 335 horsepower. Everything comes with an 8-speed automatic. The 530e plug-in hybrid, with blue stuff in its teeth. Just after launch will come the 530e plug-in hybrid good for a combined output of around 250 horsepower from both the combustion engine and electric motors. The M550i will also follow along with a 455 horsepower 4.4 liter V8 that gets it to 60 miles per hour in just four seconds, which bests the outgoing M5. The new 5 Series also catches up with Mercedes on its attempt at driver-assistance systems, with the car now allegedly able to follow along and even overtake other cars on the highway, as well as communicate with other BMWs on the road. The new 5 goes on sale in February, with the plug-in hybrid and M550i following in March. The next M5 should also come along next year. Let’s hope it finds a way to actually draw attention to the car, because the styling isn’t doing it any favors.